A website wireframe is a skeletal framework of the website that presents a visual guide to the users and is also referred to as the page schematic. 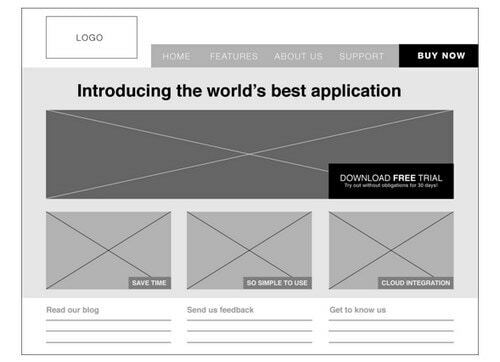 Website wireframes have a number of purposes behind their development. The most important of these is that they serve to portray and present the website as intended by the owner, for the accomplishment of a predetermined purpose. This makes the website wireframe an indispensable requirement in designing a webpage. A website wireframe usually contains the barebones of the website and has merely the interface elements and the systems for navigating the website. It does not contain any formatting with respect to style, animations, colours, graphical elements and other common features that make a website attractive. The only thing a website wireframe achieves is to make it clear to the owner whether the layout in which the site has been framed does justice to the intention with which the site was brought into existence in the first place. This is where the pseudonym of “screen tester” given to website wireframes comes into vogue, especially since the wireframe is built for the purpose of testing whether the screen is doing what it is meant to do, and if not, then to detect the problems and correct the same. It must be understood at this juncture that the purpose of a website wireframe is not to make sure the cosmetic look of the page is palatable, but rather that the purpose of the website is done justice by the arrangement of the various elements that make the page and the website. Wireframes are usually of a variety of forms and portrayal, and they can be brought into existence in a number of ways – from the pencilled drawings of early website developers who are just starting out and wading into unknown waters, to the broad array of designs made by application of software that is more common today. Wireframes are created by many professionals such as business analysts, interaction designers, information architects, experience designers, programmers and even product managers. Before building a wireframe for your own website, you need to be fully aware of the various elements that go into making a website wireframe and how they finally give the wireframe its shape which in turn enables it to serve its purpose. The skeleton structure of any website can be broken down to three major components – navigation design interface design and information design. These three elements, when coming together, form the page setup. In contrast, the website wireframe serves to define the relationships among these three elements. This is the element that concerns itself with the three Ps of information – prioritisation, placement and presentation. It serves to do this in such manner so as to enable quick and clear understanding. This area is primarily concerned with experience of the user when using the website, as it is meant to display the information in an effective manner so as to ensure smooth and clear communication. Thus, it is imperative that website elements be arranged in such manner so as to reflect, serve and justify the tasks that the user wants to perform on the website as well as the goal that the user wants to fulfil the using the website. Navigation refers to the facility that the website provides to the user to enable him or her to move from page to page within the website and to perform the various functions that he wants to on the different pages without undue hassle. The navigation design serves the purpose of using different screen elements to effectively convey the relationships among different links on the website, which will be used by the user to move around the site. A proper navigation design provides a website with a clear navigation system that is lucid and intuitive to understand so that it does not confuse the user. It is also not uncommon for websites to have multiple navigation systems which can be sub categorised as global navigation, local navigation, supplementary navigation, contextual navigation, courtesy navigation, etc. We have long since passed the age of using text codes and commands to interact with our personal computing devices. Furthermore, with the advent of mobile computing and operating systems specially designed for the portable devices, it has become extremely important that the tools to interact with a website should be graphic. The term graphic here means that the interface of the website should respond to click or touch inputs. Thus, the goal of the interface design element is to enhance the usability of a website so that users can efficiently take advantage of it. An interface design of any website makes common use of various elements such as text boxes, check boxes, drop down menus, action buttons and the like. Creating a website wireframe is a collaborative effort since it involves combining visual design elements with information architecture. However, in an organisation that does not provide well-defined role parameters as well as the duties and responsibilities pertaining to that role, and maintains a flexible work culture, this will result in chaos on a large scale. As a result of overlaps caused by this lack of role specification, coupled with lack of proper demarcation of operation and responsibility, wireframe is often seen as a hotbed of conspiracy and controversy. Thus, often times, businesses will design their own basic wireframes based on the needs and preferences of the customers. This will be followed by the designers involved in a bid to improve the wireframe – which a daunting task, especially due to the fact that wireframes cannot display various interactive details that users have come to expect – which are more advanced than simple 2D diagram. Low fidelity website wireframes are usually crude and more often than not represent rough sketched and quick mocks of the wireframe. Such rudimentary designs, however, do serve a purpose as they facilitate the effective and efficient collaboration of the team that is working on the project. These find ample use in the early stages of a project and use rudimentary symbols such as rectangles and dummy content to represent data. These low fidelity wireframes are essential in the initial stages of a project and is a great motivator for brainstorming among the team to develop a better wireframe. The building of a website wireframe is crucial not only for the sole purpose of determining how well the different elements and components interact with each other, but also to judge how well the site would fulfil its actual intended purpose. One has to understand that the main concern here is not the fact that the site looks good or is attractive to look at from a cosmetic point of view, but the fact that is being adjudged is how well the site interacts with the user and whether it fulfils the requirements of the user that it initially went out to do. In this respect, the building of a website wireframe is immensely important and cannot be downplayed. There are a number of tools that will enable website owners to streamline their data and draw useful inferences based on that data, all by way of website wireframe design. Several of these tools are fully fledged advanced level programs which are run natively on any computer operating system to enable the development of the website. We are going to explain how to build a website wireframe using the tool called Gliffy, which allows you to create a wireframe for your website without any sort of colours or formatting and stresses on the importance of developing the wireframe out of content strategy, the allowance for collaboration and the visual assessment of your ideas before the final execution is initiated. 2) Your next step will be to drag the appropriate container shape onto your canvas, whether that’s a desktop browser window shape or a mobile device shape. Within the confines of that shape, you can then drag and drop in the components of your page—menus, images, videos, interactive elements, copy (using the text tool), or anything else. You’ll be able to find all the standard wireframe shapes within the shape library, but remember that you can always upload any image you like and use that as a shape, too. Just click “More Shapes” and then “Add Image Library” and follow the on-screen instructions. 3) As you develop your wireframe, you can adjust the properties of each shape on your canvas to set line weights, text sizes, and the precise position and aspect ratio of each element. Just select an element on your canvas and then click on the properties icon that appears. 4) If you are uncomfortable with any of the above steps – or with all of them- then you can still create a wireframe for your website by using the online templates Glorify platform provides. Choose one template from the many that are available there and you are good to go. 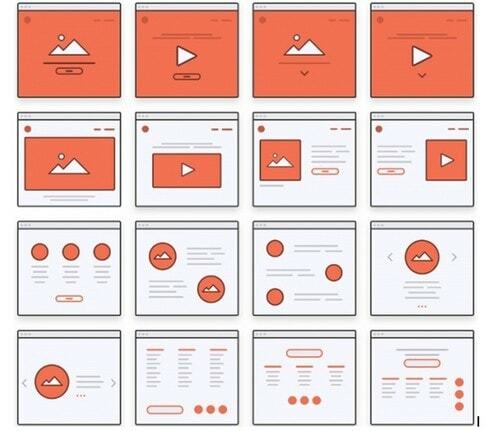 Generally speaking, wireframes are not the place where you play with design aspects of your website or with details such as fonts, colour choices, image placements and the like. However, it is extremely important to make sure that you have created a hierarchy of your content that is not only easy to follow, but also practical, effective and comprehensible. 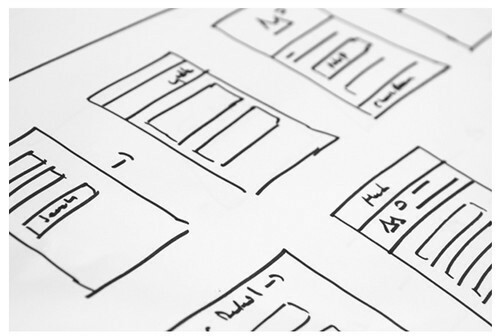 The uses of website wireframes are varied and spread across several disciplines. They are used by developers in order to make way for a more tangible understanding of the website’s functionality and in order to decide the user interface design and to move things forward in that regard. 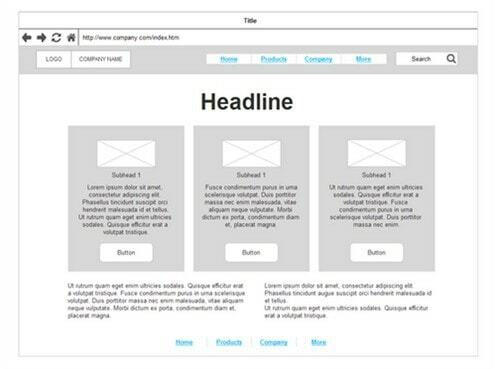 Website wireframes find ample use among information architects and experience designers to portray the navigation path or paths of the website and even a page within the site. In a completely different use case, the business analysts utilize wireframes to find and provide visible support for the rules of business and the requirements that interaction with elements on screen professes.